Many times throughout her waste history Nokia showed it is in many ways modern and future looking company. Nokia is to a great extent responsible for today’s mobile phone industry and networking, but this Finnish company is always fully dedicated to technology evolution. Heather picture was taken in Nokia Campus and there you can see fully autonomous driverless vehicle, that operates in the streets of campus. The full name of this French made bus is EZ-10 that can take up to 12 passengers and it can reach the speed of 40 km/h. 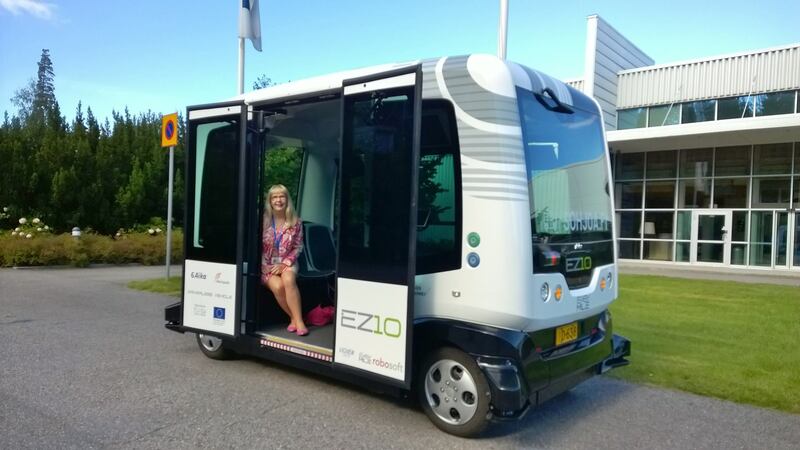 Autonomous bus was first tested on a seaside public road in Hernesaari district in Helsinki, where passengers were enjoying easy ride and were accompanied with attendant which could engage manual driving mode if something happens. Nokia’s Innovation Steering unit was also involved in the whole process so It doesn’t wonder to see one operating in Nokia campus. After Helsinki, electric buses will leave in September for Tampere and Espoo to be tested for the harsh winter conditions.